Special, targeted supplemental support for individuals with undesirable blood sugar levels who may have special dietary needs for higher amounts of important micronutrients. Formulated by doctors Johnathan Wright and Alan Gaby. 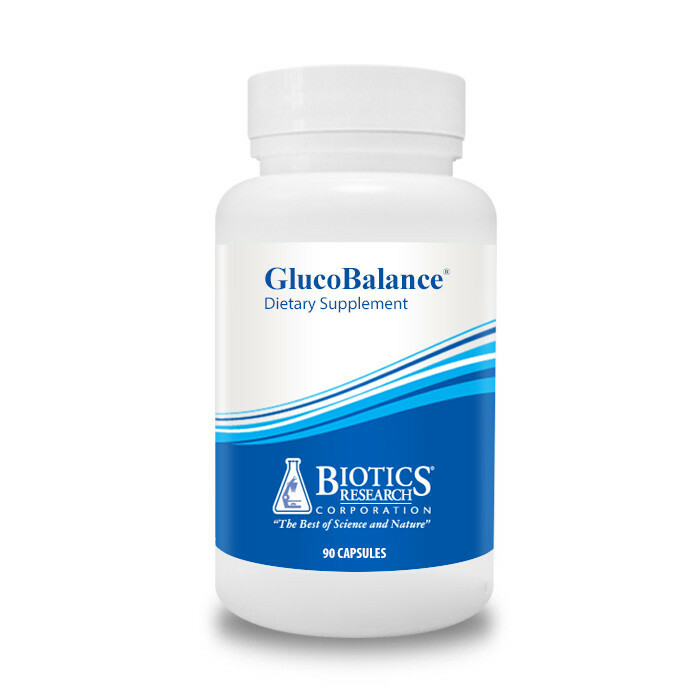 GlucoBalance is a potent multi vitamin and mineral that offers a number of benefits. Formulated for Biotics Research by Jonathan V Wright, MD and Alan R Gaby MD, leaders in the field of nutritional science. Contains nutrients in suitable amounts to help balance blood glucose levels when faced with a busy professional life, and stresses - which would otherwise contribute to imbalances in blood glucose. Contains nutrients that support muscle and encourage fat metabolism. Contains good levels of antioxidants including Vitamin E and Selenium that protect cells from free radical damage. Contains a uniquely high amount of biotin – 3000 mcg - which is essential for the first step on converting carbohydrates into energy. Contains good levels of B vitamins that support energy and the nervous system. Contains vitamins that support adrenal function including B vitamins and Vitamin C.
GlucoBalance can help to reduce an excess appetite. Glucobalance has been clinically trialled with Flax Seed Oil and found to lower blood triglyceride levels, and cholesterol whilst improving HDL (good) cholesterol. Why take supplements to support blood glucose balance? Effective Regulation of blood glucose has implications for health. Even mild disruptions of glucose homeostasis can have adverse consequences. Chronic diabetes may result in cardiovascular disease, neuropathy, blindness or renal failure. Hypoglycemia (also called reactive hypoglycemia or dysinsulinism), though not general associated with the organ damage seen in diabetes, can be responsible for a number of troublesome physical and psychological symptoms. The human body possesses a complex set of checks and balances to maintain blood glucose concentrations within a narrow range. Blood sugar control is influenced by the pituitary, thyroid and adrenal glands, as well as by the pancreas, liver, kidney and even skeletal muscle. Glucose homeostasis also depends on the presence of a wide range of micronutrients. In the typical American diet, high in refined and processed foods, many of these micronutrients are in short supply. In addition, some individuals with blood sugar disorders may have a special dietary need for higher amounts of one or more micronutrients. As a component of glucose tolerance factor, niacin plays an important role in carbohydrate metabolism. Many refined foods consumed by Americans are depleted of niacin. Grains and other foods that are “enriched” usually contain added niacinamide, which apparently cannot be converted by the human body into niacin. In addition, many vitamin supplements contain niacinamide, rather than niacin. Although niacinamide is capable of performing most of the functions of vitamin B3, a small amount of niacin seems to be necessary for the synthesis of GTF. Both niacin and niacinamide may also be important for blood sugar control through a mechanism unrelated to GTF. As precursors to NAD, which is an important metabolite concerned with intracellular energy production, niacin and niacinamide may prevent the depletion of NAD in pancreatic B cells. Biotin may also play a role in stabilising blood sugar levels through biotin-dependent enzymes acetyl Co A carboxylase and pyruvate carboxylase. Thus biotin deficiency should be avoided in those with blood sugar disorders. Ascorbic acid deficiency may allow sorbitol to accumulate in erythrocytes, which may pre-dispose diabetics to certain types of end-organ damage. Care should be taken to ensure that those with blood sugar abnormalities have adequate ascorbic acid intake. Both B12 and folate are involved in a number of different steps in carbohydrate metabolism and the incidence of B12 deficiency was significantly greater in a series of diabetics than in the general population. Folate is involved with gluconeogenesis as a cofactor with key enzymes in the liver and small intestine. Deficiency of either B12 or folate is to be avoided in those with blood sugar abnormalities. Central to carbohydrate metabolism and Krebs Cycle function is adequate thiamine levels, and diabetics are more often deficient in thiamine. Care should be taken to ensure that thiamine intake is adequate in those with diabetes and hypoglycemia. Carnitine is involved as part of a vital transport mechanism of fat metabolism in which fat enters energy production pathway. Carnitine supplementation may be considered in those with blood sugar abnormalities. Vanadate is an oxidised form of vanadium. Due to possible insulinotropic effects of vanadate , inadequate amounts of this trace mineral is undesirable in those blood sugar abnormalities. Vitamin E and selenium are essential nutritional factors which act as antioxidants and may be involved in glucose balance. As many complications associated with diabetes may be related to excess free radical activity, prudence demands that adequate selenium and vitamin E be supplied in the diabetic diet. Eat regular meals containing high biological value proteins and consume whole, fresh foods, and minimise all forms of refined sugar and carbohydrates. Drink plenty of fresh water. Chew food well, and relax when eating. Take some form of exercise daily. If diabetic, consult your doctor before use. Toepfer EW, Mertz W. Polansky MM, Roginski EE. Wolf WR. Preparation of chromium-containing material of glucose tolerance factor activity from brewer’s yeast extracts and by synthesis. J Agric Food Chem 1977;25:162-166. Schroeder HA, Nason AP, Tipton IH. Chromium deficiency as a factor in atherosclerosis. J Chronic Dis 1970;23:123-142. Anderson RA, Kozlovsky AS. Chromium intake, absorption and excretion of subjects consuming self-selected diets. Am J Clin Nutri 1985;41:1177-1183. Glinsmann WH, Mertz W. Effect of trivalent chromium on glucose tolerance. Metabolism 1966;15:502-510. Urberg, M. Zemel MB. Evidence for synergism between chromium and nicotinic acid in the control of glucose tolerance in elderly humans. Metabolism 1987;36:896-899. Anonymous. Biotin and glucokinase in the diabetic rat. Nutr. Rev 1970;28:242-244. Davis RE, Calder JS, Curnow DH. Serum pyridoxal and folate concentrations in diabetics. Pathology 1976;8:151-156. Jone CL, Gonzalex V. Pyridoxine deficiency: a new factor in diabetic neuropathy. J. Am Podiatry Assoc 1978;68:646-653. Wolf WR, Holden J, Greene FE. Daily intake of zinc and copper from self selected diets. Fed Proc 1977;36:1175. Klevay LM, Canfieldl WK, Gallagher SK, Henrickson LK, Bolonchuk W, et al. Diminished glucose tolerance in two men due to a diet low in uric acid in the control of glucose tolerance in elderly humans. Metabolism 1987;36:896-899. Morgan KJ, Stampley GL, Zabik ME, Fischer DR. Magnesium and calcium dietary intakes of the UI.S. population. J Am Coll Nutr 1985;4:195-206. Lakshmanan FL, Rao RB, Kim WW, Kelsay JL. Magnesium intakes, balances and blood levels of adults consuming self-selected diets. Am J Clin Nutri 1984;40:1380-1389. Srivastava US, Nadeau MH, Gueneau L. Mineral intakes of university students; magnesium content. Nutr Rep Int 1978;18:235-242. Yajnik CS, Smith RF, Hockaday TDR, Ward NI. Fasting plasma magnesium concentrations and glucose disposal in diabetes. Br Med J 1984;288:1027-1028. Ceriello A, Guigliana D, Dello Russo P, Passariella N. Hypomagnesemia in relation to diabetic retinopathy. Diabetes Care 19825:558-559. Stebbing JB, Turner MO, Franz KB. Reactive hypoglycemia and magnesium. Magnesium Bull 1982;2:131-134. Emdin SO, Dodson GG, Cutfield JM, Cutfield SM. Rose of zinc in insulin biosynthesis. Some possible zinc-insulin interactions in the pancreatic B-cell. Diabetologial 1980;19:172-182. Arquilla ER, Packer S, Tarmas W, Miyamoto S. The effect of zinc on insulin metabolism. Endocrinology 1978;103:1440-1449. Herington AC. Effect of zinc on insulin binding to rat adipocytes and hepatic membranes and to human placental membranes and IM-9 lymphocytes. Horm Metab Res 1985;17:328-332. Wolman SL, Anderson GH, Marliss EB, Jeejeebhoy KN. Zinc in total parental nutrition: requirements and metabolic effects. Gastroenterology 1979;76:458-467. Holden JM, Wolf WR, Mertz W. Zinc and copper in self-selected diets. J Am Diet Assoc 1979;75:23-28. Sarji KE, Kleinfelder J, Brewington P, Gonzalez J, Hempling H, et al. Decreased platelet vitamin C in diabetes mellitus: possible role in hyperaggregation. Thromb Res 1979;15:636-650. Secher K. The bearing of the ascorbic acid content of the blood on the course of the blood sugar curve. Acta Med Scand 1942;60:255-265. Verlangieri AJ, Sestito J. Effect of insulin on ascorbic acid uptake by heart endothelial cells: possible relationship to retinal atherogenesis. Life Sci 1981;29:5-9. Hutchinson ML, Lee WYL, Chen MS, Davis KA, Ely JTA, et al. Effects of glucose and select pharmacologic agents on leukocyte ascorbic acid levels. Fed Proc 1983;42:930. Vinson JA, Staretz ME, Bose P, Kassim HM, Basalyga BS. In vitro and in vivo reduction of erythrocyte sorbitol by ascorbic acid. Diabetes 1989;38:1036-1041. Fore H. Manganese-induced hypoglycemia. Lancet 1963;1:274-275. Shrader RE, Everson GJ, Pancreatic pathology in manganese-deficient guinea pigs. J Nutr 1968;94:269. Wenlock RW, Buss DH, Dixon EJ. Trace nutrients. 2. Manganese in British food. Brj Nutr 1979;41:253-261. Wilkinson JF. Diabetes mellitus and pernicious anemia. Br Med J 1963;1:676-677. Lifshitz F, Moak SA, Wapnir Ra. Folic acid in the prevention of fasting induced hypoglycemia. Pediatr Res 1977;11:518. Haugen HN. The blood concentration of thiamine in diabetes. Scand J Clin Lab Invest 1964;16:260-266. Fagin JA, Ikejiri K, Levin SR. Insulinotropic effects of vanadate. Diabetes 1987;36:1448. Asayama K, Kooy NW, Burr IM. Effect of vitamin E deficiency and selenium deficiency on insulin secretory reserve and free radical scavenging systems I islets: decrease of islet manganosuperoxide dismutase. J Lab Clin Med 1986;107:459-464. Echert CD, Breskin MW, Wise WW, Knopp RH. Association between low serum selenium and diminished visual function in diabetic women. Fed Proc 1985;44:1670. Pennington JAT, Young BE, Wilson DB, Johnson RD, Vanderveer JE. Mineral content of foods in total diet: selected minerals in food survey, 1982-1984. Jour Am Diet Assoc. 86;876, 1986. Coggeshall JC, Heggars JP, Robson MC, Baker H. Biotin status and plasma glucose in diabetics. Ann NY Acad Sci 1985;447:389-393. Six (6) capsules each day, two (2) capsules taken with each meal as a food supplement. Do not exceed the recommended daily dose. Not to be used as a substitute for a varied diet. Warning: If you are taking diabetes medication, do not use this product without medical supervision. Ingredients: Capsule Shell (Gelatin and wWater) Magnesium Oxide, Magnesium Citrate, Calcium Ascorbic Acid, Calcium Citrate, Calcium Carbonate, D-Alpha Tocopheryl Acetate, Magnesium Stearate (Vegetable Source) (E470b), Potassium Chloride, Calcium Panththenate, Niacinamide, Manganese Citrate, Lens Esculenta Vegetable Culture (Rich in Trace and Macro Minerals), Thiamine Monoitrate, Zinc Picolinate, Zinc Citrate, Pyridoxine HCl, L-Carnitine Fumarate, Niacin, Riboflavin, Copper Gluconate, Retinyl Acetate, Chromium Picolinate, D-Biotin, Selenomethionine, Cholecalciferol, Folic Acid, Methylcobalamin.